Dr. J�rgen Scheible , is a Professor, media artist, and musician from Germany who is also known by his artist alter-ego 'MobiLenin'. 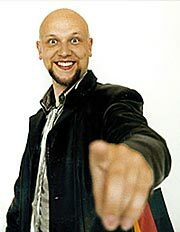 In 2012 he was apointed as a Professor at Stuttgart Media University in the department of Electronic Media. His focus in teaching and research is in the area of Interaction design, Mobile Interface design, Pervasive advertising and Urban Interaction. He is the creator of MobiSpray�, a novel art tool for creating ubiquitous ephemeral digital art via large-scale projections. He performs internationally with his 'MobiSpray tool' at cultural events and other professional settings. His MobiSpray art works are shown in art exhibitions in various countries in form of large photo prints which are also available on the art market. J�rgen worked previously for 7 years as a researcher and teacher at the Media Lab at Aalto University, School of Art, Design and Architecture, Helsinki, Finland, specializing on mobile app innovation with a strong focus on artistic approaches and creative design. He is the author of several books and book chapters and publishes scientific articles in renowned international conferences such as SIGGRAPH, ACM Multimedia and CHI. Scheible has erlier worked for 8 years at Nokia and in 2006 he was as a visiting scientist at MIT. He has been giving workshops on mobile app programming in academic and professional settings e.g. at Stanford University, MIT, NTU Taiwan, Yahoo Research and Nokia. Tutorial: Python for S60 Tutorial by Jurgen Scheible. For novices and geeks - go and catch the low hanging fruits! MobiSpray. An innovative art tool that allows light-based painting by using a mobile phone as spray can. Check Videos and Photos here. Video: Python S60 workshop given by Jurgen Scheible @ UIAH Media Lab, Helsinki. See what New Media Students did with PyS60. Video: Python S60 workshop given by Jurgen Scheible @ Berkeley University, California / Yahoo Research Labs Berkeley. See what CS Students and Yahoo staff did with PyS60. Video: Comments by people who use PyS60. See and hear what they say. My international award winning research project that bridges Art & Technology. It uses Python on Smartphones and large public displays to bring new kinds of social experiences to people. It includes an interactive music video. When I travel I produce instant art that reflects my location, mood, and environment simply by using my Mobile phone and a python app that I wrote for it. Check out my art images. Manhattan Story Mashup is an urban storytelling game that combines mobile phones, the web and a public display at Times Square NY into interactive, collaborative street art. I've designed this game together with Ville Tuulos for Nokia Research Center. 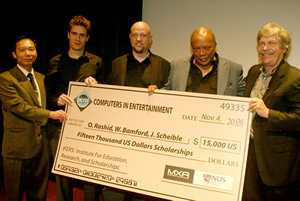 I am one of the 3 winners of the 2006 ACM Computers in Entertainment $15,000 Scholarship Award. The award was handed over by Mr. Quincy Jones, Dr. Alan Kay, and CIE Editor-in-Chief Newton Lee in Hollywood at the Americam Film Institute. Omer Rashid, Will Bamford of Lancaster University (UK) and me got the award for our CIE Jorunal article "PAC-LAN: Mixed reality gaming with RFID enabled mobile phones.